In Singletons are Pathological Liars we discussed the problems of having singletons in your code. Let's build on that and answer the question "If I don't have singletons how do I ensure there is only one instance of X and how do I get X to all of the places it is needed?" Construction Graph: This graph shows which object created which other ones. Call Graph: This graph shows which other methods each method calls. A stack-trace would be a single slice through this graph. If the new operators are mixed with application logic (see: How to Think About the new Operator) then the Constructor Graph and the Collaborator Graph tend to be one and the same. However, in an application which uses Dependency Injection the two graphs are completely independent. Lets have a closer look at our CreditCardProcessor example. Suppose this is our collaborator graph which we need to execute a request. The above shows the application collaborator graph. The letter (S/R) in the corner designates object lifetime; either Singleton or Request scope. Now, just to be clear, there is nothing wrong with having a single instance of a class. The problem arises only when the singleton is available through a global "instance" variable as in Singleton.getInstance(). 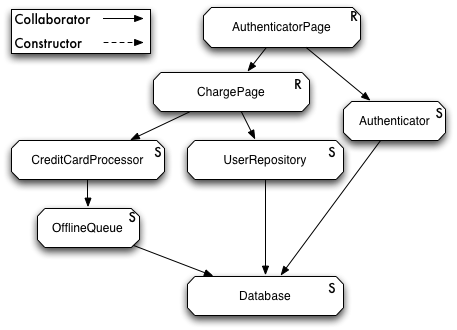 The HTTP request would come to AuthenticatorPage which would collaborate with Authenticator to make sure the user is valid and forward a valid request onto ChargePage which would then try to load the user from UserRepository and create the credit card transaction which would be processed by CrediCardProcessor. This in turn would collaborate with OfflineQueue to get the work done. Now, in order to have a testable codebase we have to make sure that we don't mix the object construction with application logic. So all of the above objects should rarely call the new operator (value objects are OK). Instead each of the objects above would declare its collaborators in the constructor. AuthenticatorPage would ask for ChargePage and Authenticator. ChargePage would ask for CreditCardProcessor and UserRepository. And so on. We have moved the problem of construction elsewhere. So now the problem is, how do we construct the graph of objects? Notice that when we create a RequestFactory we must pass in references to the Authenticator, UserRepository and CreditCardProcessor. This is because when we call build() on RequestFactory it will try to instantiate AuthenticatorPage which needs the Authenticator. So we need to pass the Authenticator into the constructor of RequestFactory and so on. At run-time an HTTP request comes in. The servlet has a reference to RequestFactory and calls build(). The servlet now has a reference to the AuthenticatorPage and it can dispatch the request for processing. Every object only has references to what it needs directly! No passing around of objects which are not directly needed by the code. There is no global state at all. Dependencies are obvious since each object only asks for what it needs. If an object needs a reference to a new dependency it simply declares it. This change only affects the corresponding factory, and as a result, it is very isolated. All of the new operators end up in the factories; application logic is devoid of new operators. The problem of "how do I ensure that I only have one of something" is nicely sidestepped. You instantiate only a single ApplicationFactory in your main, and as a result, you only instantiate a single instance of all of your singletons. Now the factories become largely a series of object creations. Totally boring stuff, so boring a computer could generate the code. Simply look at the constructor and recursively instantiate whatever the constructor wants. Wait, a computer can generate it! Its called PicoContainer or GUICE! So you don't actually have to write the factories. > All of the new operators end up in the factories; application logic is devoid of new operators. Why not place your factories in the new operators? Either way you haven't changed a thing. Thanks for that interesting post. Do you know of any tools that can create such object graphs or do you make them always manually?